StoneTree® Security Barriers for Utility Sites meet U.S. Department of Homeland Security and NERC requirements to increase security for sensitive and critical assets of the transmission and generating facilities industry. StoneTree® Utility Security Barriers are the efficient solution to enclose utility projects, protect high-voltage apparatus or specialized utility equipment from unauthorized personnel, and define boundaries. The construction process of StoneTree® Utility Walls is faster than conventional CMU or traditional two-piece or stackable panel and column systems, offering added value while maintaining a secure environment in less time. StoneTree® Utility Fence Walls are available in various heights up to 16’/4.8m by stacking wall sections when required. These walls combine the stability of high strength steel reinforced precast concrete and are adapted through specific engineering design for seismic, wind and geotech conditions. Meet UL 752 Level 4 Bullet resistant specification, as well as all security requirements of the DHS and the NERC. Security features such as lighting, surveillance equipment, attachments for razor wire as well as conduit can be integrated into StoneTree® Utility Barrier Walls during both the manufacturing and installation process. Commercial Fence Walls built from traditional block and concrete are generally functional, but not necessarily attractive. Our walls are highly decorative and are designed to have textured pattern on both sides. 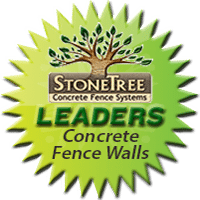 The StoneTree® Concrete Fence Wall System has been designed to be the safest, most labor-efficient commercial fence wall on the market. Corporations, retailers, municipalities, homeowner associations and other entities seek innovative ways to increase awareness of their business. Commercial Fence Walls which incorporate brand identity logos or icons are a constant, yet subtle reminder of a company’s products or services. StoneTree® HOA Fence Walls act as a sound wall noise barrier against undesirable noises such as automobile and sidewalk traffic, noisy neighbors, etc. StoneTree® Hurricane Fence Walls are formed vertically using Combo-Cast™ Technology, whereby the wall panel and column are cast as a monolithic unit. Each section is 15’ in length and available in various fence wall heights. StoneTree® Combo-Cast™ Walls are designed to weather storms without breaking, cracking or falling over. Perimeter fence walls surround a wide variety of land parcels, including residential developments, military compounds, municipalities, retail locations, utilities and more. StoneTree® Perimeter Fence Walls are designed to keep intruders and prying eyes away from the area being protected. They have been used to surround sensitive equipment such as television broadcast satellites and utilities. Not only are StoneTree® Fence Wall Panels easy to install around the outside of a real estate project, but they are also easily removed in the event that access is needed to an area currently being enclosed. With concrete being such a dense building material and having reflective sound properties, StoneTree® Fence Walls serve as effective noise reduction barriers. StoneTree® Concrete Fence Wall Systems are an attractive, safe, efficient and cost-effective option for barrier walls anywhere in the world. Call today or fill out our form to the left to learn more about our precast concrete walls and fence systems!